Fortune Island was once a popular Filipino dive spot, relatively remote at the time, surrounded by coral reefs teeming with fish. Sharks were common, as were all sorts of other underwater wildlife, with the occasional pod of dolphins passing by. Not so today. Decades of illegal dynamite fishing have taken their toll, destroying large swaths of coral and scaring away most of the fish. Today, even as the reef struggles to recover, illegal fishermen still bomb the reef for fish, killing coral habitats and killing their own future source of livelihood. Still, despite the occasional dynamite explosion, Fortune Island remains a popular dive spot, more accessible now that an extensive resort has risen on the beach. The Blue Hole, about twenty meters out from the shore of Fortune, starts at fifty feet: three large holes in the reef descend into the rock, opening at seventy feet into a wide cavern with its facing out of the wall, towards the sea. The cavern is large but shallow, more of a twenty foot-high mouth, tapering down to a tight enclosure about twenty feet in. We hadn’t been there for several years, so we had some trouble finding it from the surface, but Francis (my elder brother) finally spotted it from a kayak, and we anchored the yacht just over a sandy ridge leading to the hole. The water was wonderfully clear, and a bit warm. We spent the first twenty minutes of the dive going the wrong way. In our disorientation, we had dived towards the other end of the island, and we knew we were in the wrong place when a current sprang up from beyond the lee of the island. The diversion was not wasted for me, though. I passed over a surly old giant clam, which grumpily closed up as I approached. (I can’t think of any other adjective for its attitude, but he sure seemed surly.) A huge lobster, antennae and eyestalks curiously probing, made its appearance from under the rock as we were turning around. No one else saw it, which was a bit of a shame; my brother had the camera. We made our way back to the boat, and just beyond it in the other direction, there were the caves. We descended into the hole, each of eight divers picking an entry point, and we all met in the cavern underneath. Docile nurse sharks used to live in the Blue Hole, but today they are gone, and most of the life consists of new coral and small fish. (Dad says he saw some large yellow-tailed grunts, but I missed them.) In one corner of the cavern, gently lit by light filtering through the holes above, fish slept in midwater, barely finning as they hovered over the coral. It was odd to see them like that, floating in suspended animation, so still I wondered if I wasn’t caught in a time warp. The highlight of the day was a large but shy octopus nestled in a small hole in the sand, just outside the cavern. We could not by any means coax him out, however, and any attempt to pull him out of his hole only forced him in deeper. We decided not to bother him any further. Having lost half of our dive time going the wrong way earlier, we had to ascend to the boat after about ten minutes in the hole. On the surface, we decided not to move to another site anymore, and just spend the afternoon diving Blue Hole again. 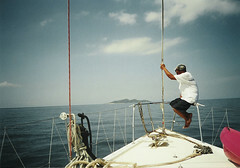 After a snack on the yacht, we geared up and dove back into the water, knowing this time exactly which way to go. After a few minutes exploring the sparse coral above the cavern, the group descended once more into the holes. I decided to be daring for once, and swam around over and down the wall and into the cavern from the other side, where we all met. Ah, the water was so clear and blue that day! I could see out of the cavern clear down the slope to the bottom, about 120 feet down, and the sunlight scintillated in blue rays from the surface. We explored the cavern again, trying unsuccessfully to coax the octopus out of its hole. It wouldn’t budge. The dive was marred by the sudden, ear-splitting boom of a dynamite explosion: blast fishing again. We had no way of judging the direction or distance, however; sound travels differently under water, and the blast could have been miles off. It didn’t happen again, though, and the dive continued uninterrupted. We left the cavern and travelled a bit down the slope, hitting a hundred feet. A large fish, with black-and-white-striped markings swam towards us rather boldly, and I thought at first from its shape that it was a baby shark. It turned out to be a very large remora, separated from its shark, and probably thinking one of us was a shark it could attach to. As it realized we were all trying to touch it, it swam off a distance, but did not leave the area. Cute thing. After our ascent, we ate lunch on the yacht, then headed back to the beach resort in Punta Fuego. I spent the rest of the day — and the night — nursing a splitting headache. That’s what I get for bouncing to a hundred feet while out of condition. We spent the next day lounging at Punta Fuego, and attending Palm Sunday mass in the clubhouse. Of course, I skipped mass, being the only evangelical Protestant in a family of Catholics. I opted instead to wander around the clubhouse, and luxuriated in the airconditioned amenities of the clubhouse locker room. It was hot outside. Really, really hot. After lunch on board the yacht, Dad had the crew put up the sails, and we spent the rest of the afternoon sailing at a leisurely eight knots back to Manila from Batangas, catching sun, wind, and waves along the way. For the next two days, I’ll be packing up for our trip to Palau on Wednesday. Then I will well and truly be on vacation, for more than a week: no phones, no TV, no email, no internet. Just sun, sand, and diving! I’ll be back late next week with a new entry for the travel journal.